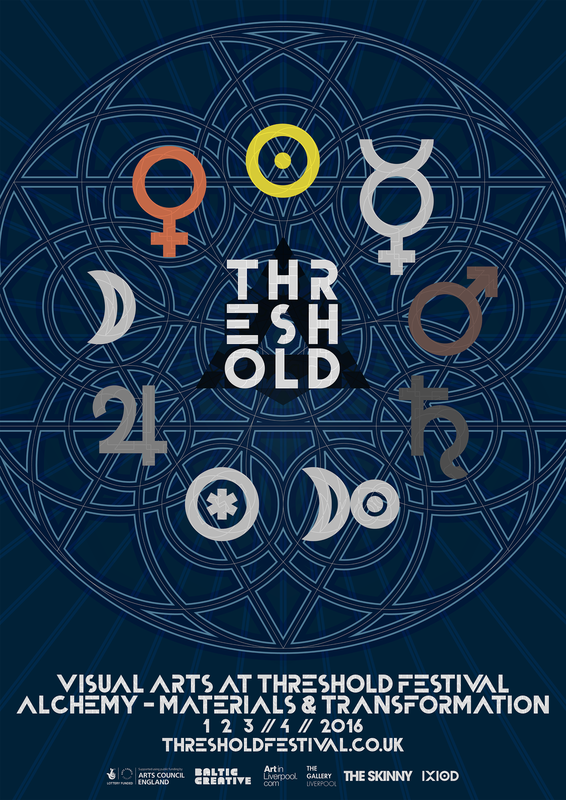 It is an honour to be selected as one of the visual artists exhibiting at this year’s Threshold Festival in Liverpool. The 2016 exhibition is entitled “Alchemy: Materials & Transformation” and will feature in 9 venues across the Baltic Triangle, with over 40 participating artists from Merseyside and across the UK. I’ll be exhibiting my work at the main Visual Art hub, The Gallery Liverpool [Stanhope Street] but the exhibition will continue across established venues and emerging spaces in the Baltic. You can pick up Threshold weekend passes for £20 (just £10 for students) via Skiddle. If you’re quick, you may still be able to grab a cheap pass via Party For The People, but don’t delay. And for the traditionalists, you can pick up paper tickets from official Threshold stockists, Dig Vinyl and made-here. Threshold Festival takes place from 1st-3rd April, 2016 across numerous venues in Liverpool’s Baltic Triangle. After publishing several chapbooks for other artists this will be my first publication of my own work in this format. The chapbook will called The Gift and will be free for exhibition goers to collect. Read a little more about the exhibition and project below. If the traditional definition of Alchemy is the magical transmutation of base metal into gold then gambling must be the modern version of this art. Nothing can place golden nuggets faster in your pocket than going into a betting shop in the morning and leaving that same evening a millionaire. It is just as magical (and possibly confusing) looking at the betting card with its information including form (races run), fitness, jockey, trainer, weight, age, breeding to name just a few. Horse racing is a visual feast too with the luxurious jockey’s silks, the bookies’ legendary tic-tac sign language and all the colour and excitement of a day at the track itself. It sounds so simple to pick a winner and turn your original stake into pure profit by merely sitting on your backside. In reality deciphering all the race information is totally confusing and very few punters make a profit from betting. There is an answer, a creative solution, if we view the basic information in a graphic form then it is easy to see the horses who are worthy of a bet. Our eyes merely have to see the anomaly in the pattern to pick the winner. There will be those who have the gift and those that don’t. Do you? For my 21st Birthday I ask for and received a present that changed the way I worked as an artist. This wasn’t a palette, paintbrush or new type of paper, it was a book. 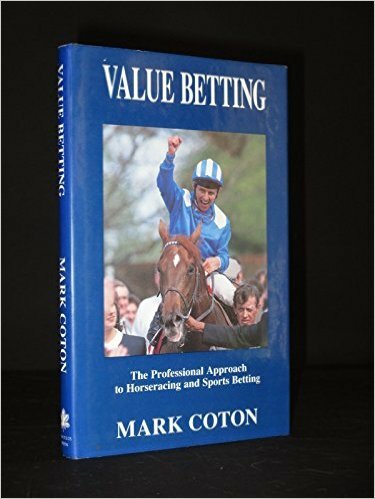 This publication was by a tipster and journalist Mark Coton and called Value Betting. It didn’t tell you how to pick which horse would win but how to look at information to suit your own needs. It required the reader to play the long game, to win over a season rather then walk away from each day with your Midas touch intact. I applied this approach to my life as well as my art, and since then I have been a compulsive systems maker. I devise and create patterns of working, exhibiting and creating in my head and then go out into the physical world to apply them. These diagrams are both art and information. Each horse is assigned a counter or token image, this is changed in size and location through its application to a specific system. It is the viewers choice as to which token catches their eye, this is the one they can bet on. The art will take the form of a book (published by Sampson Low Ltd specifically for the Threshold festival) and contains the answers/results in the back pages so the reader can see if they have ‘the gift’ and could make a profit by betting in this way. Not only is the Threshold Festival a fertile ground for trying new ideas like this but Liverpool is its home. Aintree (Liverpool) hosts the most famous horse race in the world with The Grand National happening just one week (7th April) after the 2016 Threshold Festival(1-3rd April). This would be the perfect opportunity to test the theory that we can identity the winner through the power of Art. It has been a very busy start to 2014 and at times it has been hard to keep up. 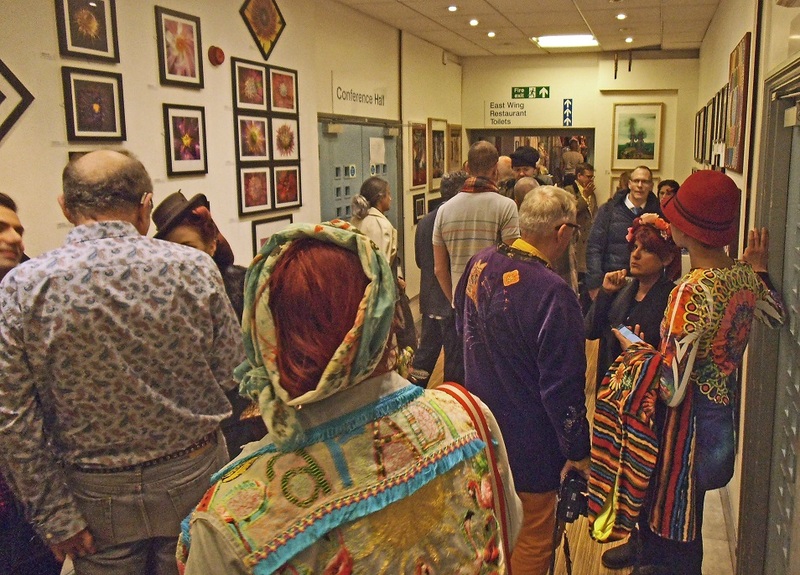 My main focus has been the imminent Jawspring exhibition at the Village Hall Gallery, Wimbledon on the 21st March. The exhibition combines the work of 17 Merton Poets and 26 artists who have been inspired by their poems. We’ll be celebrating World Poetry Day on the 21st, with a party at 6-8pm with wine and a poetry performance from 7pm onwards. 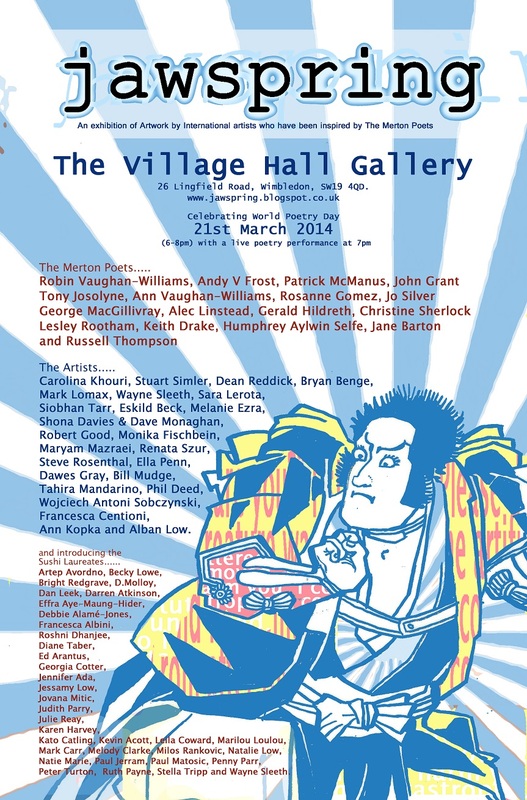 The exhibition runs from the 19th-23rd March and all the opening times are on the website. There are activities for children as well as budding adult poets too, so please come along. In January I stepped once again into the Simulated Mental Health ward at Kingston University and St George’s University London. I have written up the experience here, along with a range of sketches – Day One / Day Two. I worked closely with psychotherapist Harvey Wells on the project last year and this time around was no different. Branching out from last year’s successful exhibition was our desire and we’ve already scored a hit. We recorded the voices from the ‘patients’ and start to work with them as a resource for creative expression. 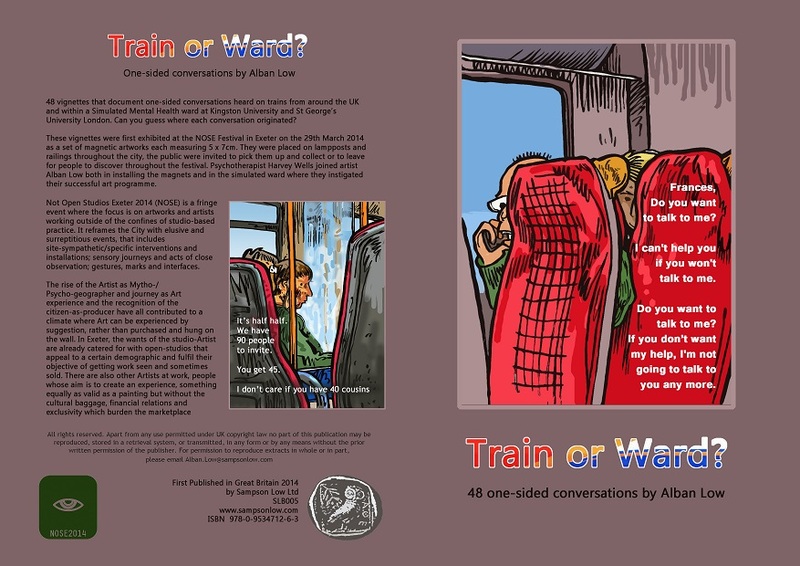 We have taken some of the one-sided conversations from the simulated mental health ward and combined them with monologues heard on public transport to produce this innovative public art installation. We were lucky enough to be selected for the NOSE Festival in Exeter on the 29th March 2014, where we will be placing 48 magnetic vignettes on the city streets. As part of this we are publishing a 5 pages pamphlet with A3 fold out poster to celebrate the exhibition. The simulations is proving a hotbed of inspiration and we have received our first poems inspired by monologues we recorded in the mental health ward. I’m busy transforming Robin Vaughan-Williams work into a poetry-film and awaiting Kevin Acott’s first contributions to the project. Our first film has been completed with a soundtrack from fearless improvisation trio Toy Rokit. They recorded it live at Survival Studios in Acton whilst the film was projected on a screen in front of them. If you would like to join me exhibiting on the streets of Bath this spring then I’m organising the FAB Fridge exhibition. I’m currently working on Leo Appleyard’s debut album ‘Through the Façade”. 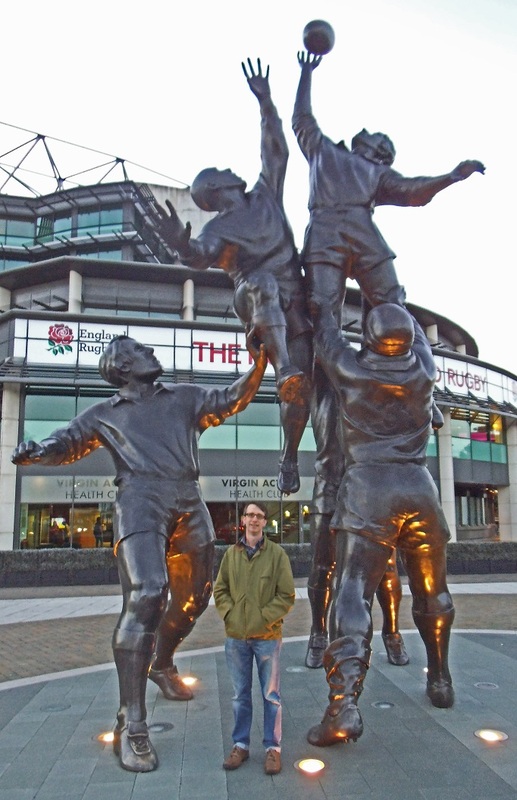 Samuel Eagles debut ‘Next Beginning’ is at the printers and will be released on F-IRE later this year. Max Luthert’s debut is ready to be printed too. Tom Yocum’s ‘Loba Lingala’ is being edited as we I write this and is nearly ready for my illustrations. Teresa Hunt’s ‘The Bats’ is finished and just needs the final design work to pull it together. 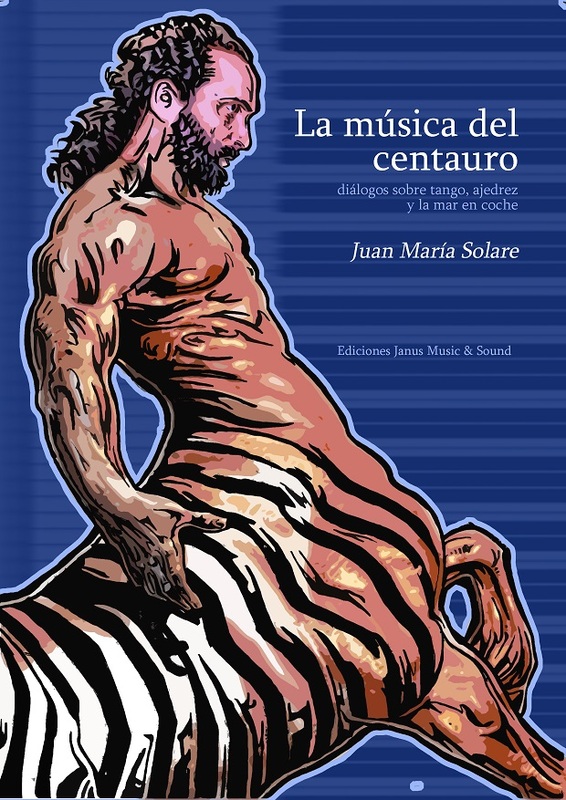 Juan Maria Solare’s book “The Music of the Centaur” is ready to be released.